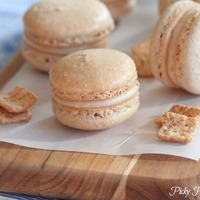 I built this to be a delightful contrast between sophisticated dessert, the French macaron, and childhood memories, Saturday mornings in front of cartoons with a big bowl of CTC. Rather than re-inventing the wheel, I started with the macaron base from my Mango Blossom Macaron recipe. The rest is pretty straightforward, though it took some work the get it all to sit in the recipe without overpowering the macaron. FLV Cinnamon Crunch is a great flavor that actually tastes a lot like CTC all by itself, with just a few minor issues. It's not quite crunchy enough - the light touch of TFA AP fixes that. It's a little low on cinnamon - FLV Rich Cinnamon solves that problem, but it's so strong. One fat drop in a 40ml is plenty. For mixing less than 40ml of this, you probably want to create a 10% Rich Cinnamon + 90% PG dilution and use it at 0.8%. The bit of Rich Cinnamon also annihilates a little hint of unwanted maple I get from the Cinnamon Crunch. FA Milk at 1% gives that FLV Cream an accurate hint of dairy to finish the recipe, without getting too soggy. Another absolutely excellent recipe. This is an ADV for me, and one of my favorites of the year. I did sub FA Cream Fresh in place of FA Milk, but it didn’t stop me from loving this stuff one bit. The Almond and Sugar Cookie almost seem to pull apart from the cinnamon and cereal to me. There’s some flavor separation going on, and I think it’s the almond doing it? Maybe? Regardless, I like whatever is happening in this little bottle. The recipe doesn’t come off dry at all, despite all the bakery stuffs and cinnamon. In fact, I think the cinnamon could be pumped up a bit without hurting anything, but it’s already so good as it is. This is something I’ll definitley be mixing again. I’m going to grab some FA Milk just to re-make some how it’s meant to be made. Thanks for sharing this one, Dave. This is a keeper, my man! I picked up Milk just to make this. So glad I did! Everything is well-balanced, and Milk gives it a very nice vibe. Another great one! I subbed FA Fresh Cream and it seems to work well. This is delicious once the rich cinnamon starts to steep into the rest. Very well balanced after 15 days. The Almond is nice and soft and doesn't scream CHERRY like some almonds/marzipans can.